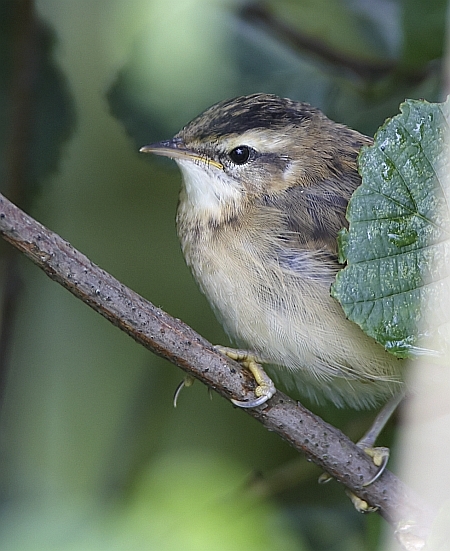 Not much happens bird-wise in Derbyshire in June – well nothing out of the ordinary anyway. 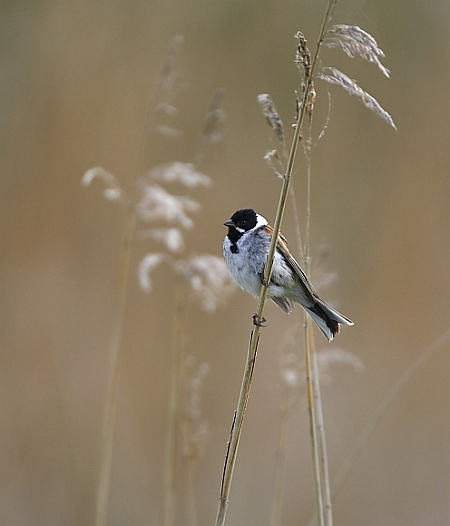 What does happen though, is that the reed beds are full to bursting with birds, singing, feeding young, arguing, preening – you name it, it’s happening. A bit of patience and the results can be very rewarding. 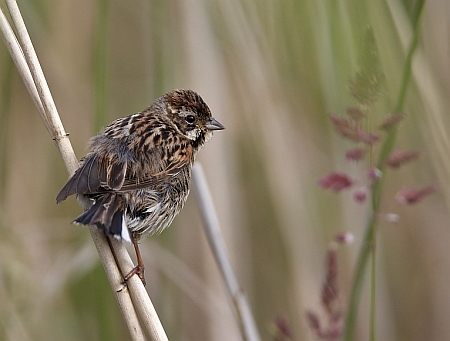 Primarily Warblers, both Reed and Sedge, but also Reed Buntings – a surprisingly beautiful bird, often overlooked. Get the light right and the images can be quite provocative and serene. I am playing with my new toy at the minute, a 600mm f4. It has allowed me to get closer than before, but at the same time allows me to experiment with very shallow depth of fields, to try and capture that Bokeh or out of focus background, much loved by photographers and viewers alike. This shot allowed me to capture the Bunting in its environment, but at the same time offer a tranquil scene in the soft morning light. Portraiture is not normally my thing, but I am beginning to enjoy it. 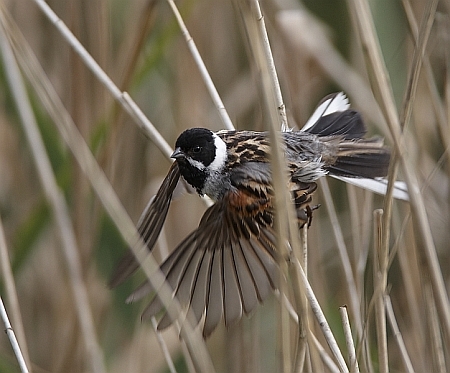 In any case, capturing flight inside a reedbed is at best difficult, at worst impossible. I did however manage to get this Reed Bunting just as it took flight. The colours of this bird are quite stunning. Of course it wouldn’t be right at this time of year not to show some “baby” bird images and Reed Bunting young are no less beautiful than their parents! 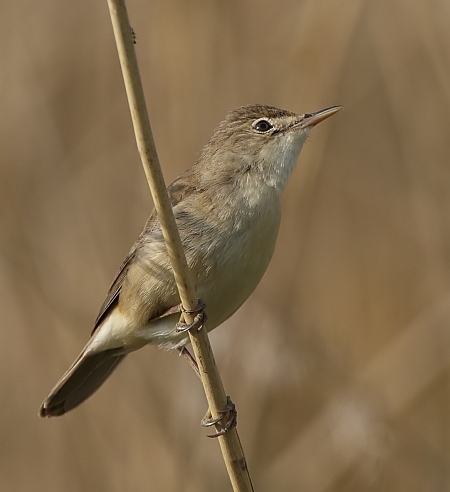 Reed Warblers are very active this time of year, feding young frantically in the bottom layer of the reed bed. 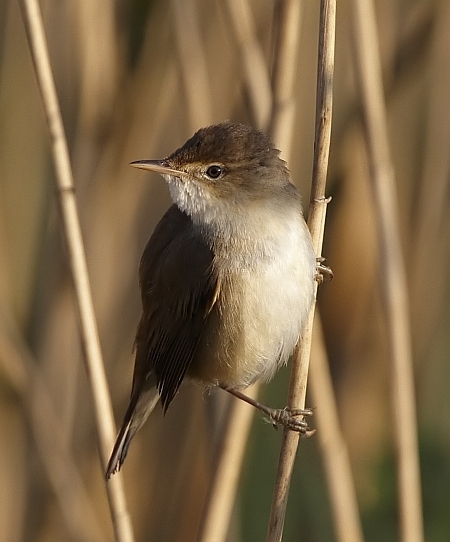 They are very adept at climbing the reed stems, even in windy weather. 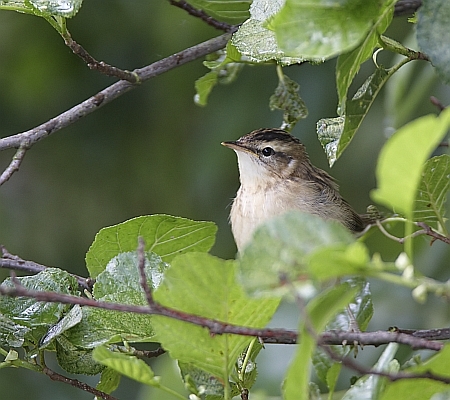 Sedge Warblers are very active pre-breeding, flying straight up into the air, then parachuting down again. 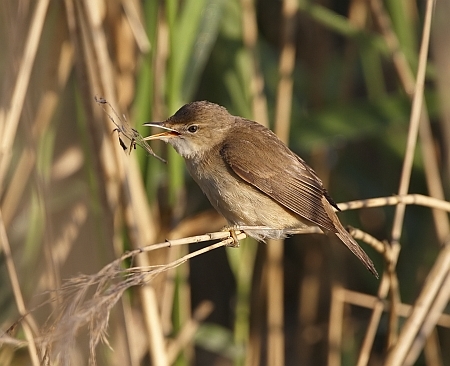 These images of a young nervous bird, make you wonder how they turn into that bird that flies hundreds of miles south, which then returns to the same place, to perform it aerobatics over the reed beds of Willington.